If ink smears on your disc or is sticky after it dries, you can adjust the color saturation and ink density. This may be necessary to make sure your designs look their best on the particular brand of discs you are using. First, load an extra CD/DVD to use for printing test patterns. Select Print Density Confirmation Pattern. Remove the disc after printing and check to see if you need to make the density darker or lighter. Load the same disc in the product again. Adjust the Print Color Correction slider to a darker or lighter setting as necessary. 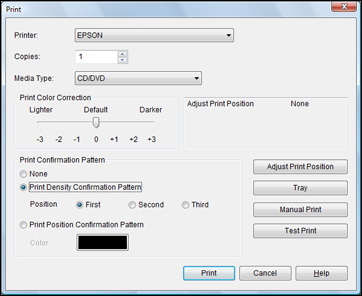 Select Print Density Confirmation Pattern and select the Second radio button. Examine the disc after printing to see if further adjustment is needed. When the ink density looks good, you are ready to print on your burned CD or DVD.